Electrosurgery and electrocautery (also called thermal cautery) are not synonymous. Electrosurgery passes current through the patient and is not suitable for some applications. Our electrosurgical unit allows for cutting, blended cutting, coagulating, fulgurating and bipolar applications. On the other hand, electrocautery passes the current through a metal wire electrode, causing it to heat. This current does not pass through the living tissue. Our thermal cautery unit is suitable for treating numerous minor surgical conditions and is ideal for applications such as dermatological, ENT, and plastic surgery cases, or any procedure that requires accurate hemostasis. These accessories are designed for use with high frequency desiccators. NOTE: WPI surgical instruments are for laboratory research applications. They are not certified for use on humans. Handheld disposable cautery are battery operated and are usually sold with replaceable tips. These thermal cautery units are designed for use in research laboratories. Coagulation - Use higher voltage in a pulsed manner to produce heat more slowly. With this method, tissue damage is more widspread (a few millimeters from the probe) and blood coagulates. Cutting - Use lower voltage with a continuous AC current to produce heat rapidly and completely vaporize the tissue at the tip of the probe. Looking for a particular Bovie part number? 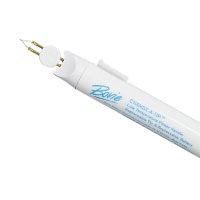 Find the WPI part number of a Bovie instrument. NOTE: WPI surgical instruments are for laboratory research applications. They are not certified for use on humans. 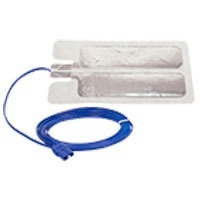 These disposable electrodes are designed for use with electro cautery units. Looking for a particular Bovie part number? Find the WPI part number of a Bovie instrument. NOTE: WPI surgical instruments are for laboratory research applications. They are not certified for use on humans. Electrosurgery utilizes alternating current at radio frequencies to cut and coagulate. 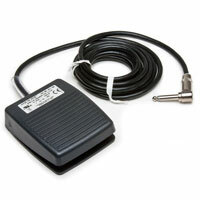 This category includes the unit and all the electrodes and accessories that go with it. 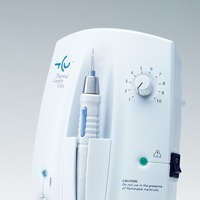 This electrosurgery system is designed for laboratory use. NOTE: WPI surgical instruments are for laboratory research applications. They are not certified for use on humans. 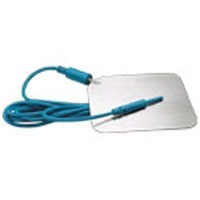 The accessories in this category are commonly used items for electrosurgery and electrocautery. For example, a foot switch, flexible light source or desiccator wall mount are frequently found in a research lab doing electrosurgery or electrocautery. NOTE: WPI surgical instruments are for laboratory research applications. They are not certified for use on humans. Electrosurgery passes high-frequency (radio frequency) alternating polarity, electrical current through the subject. Electrosurgery is used cut, coagulate, desiccate, or fulgurate tissue. This requires a "dispersive electrode," commonly called a return electrode, to be placed on the subject's body. The return electrode disperses the current so that the desiccation is isolated to the focus area. Looking for a particular Bovie part number? Find the WPI part number of a Bovie instrument. NOTE: WPI surgical instruments are for laboratory research applications. They are not certified for use on humans. Traditional thermal cautery uses heat from direct current to cauterize living tissue and limit bleeding at the incision site. Thermal cautery eliminates the possibility of alternate site burns that can occur with electrosurgery. Electric current never enters the subject's body. WPI's Thermal Cautery Unit provides all the cautery power necessary for treating numerous minor surgical conditions in a research laboratory. Our thermal cautery units are ideal for dermatology experimentation, ENT and plastic surgery applications, or any procedure that requires accurate hemostasis. 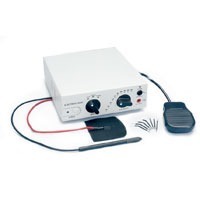 This micro cautery unit is designed for use in a research laboratory. 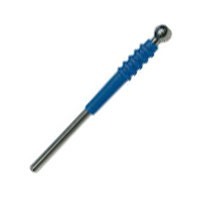 Looking for a particular Bovie part number? Find the WPI part number of a Bovie instrument. NOTE: WPI surgical instruments are for laboratory research applications. They are not certified for use on humans.